I arrived into San Francisco on Saturday late PM, and today (Sunday) was all about setup of my gear to record, setting up my location at Moscone South for the interviews and recordings that we have planned for this week. Also got to spend time with the UK JBoss crew who I flew out with and to loan them audio gear to rescue them for their upcoming videos this week. So planning ahead and bringing spare kit paid off for once - even if it was someone elses benefit other than my own. The stage is set for a much larger Summit for the 10th anniversary of Red Hat Summits. As of yesterday we were close to 4300 registrants for this years show, it's not too late to register for the discounted full summit rate. To come as my guest simply enter the discount code EMEACG at www.redhat.com/summit and you are good to go. I start recording tomorrow (Monday), finishing final audio setup and tests tonight and looking forward to it being a busy week of great content. To hear last years archived shows and in preparation for this years simply bookmark the following URL to your PC, tablet or smartphone. Look forward to creating you some great content this week !! Posted in Event. 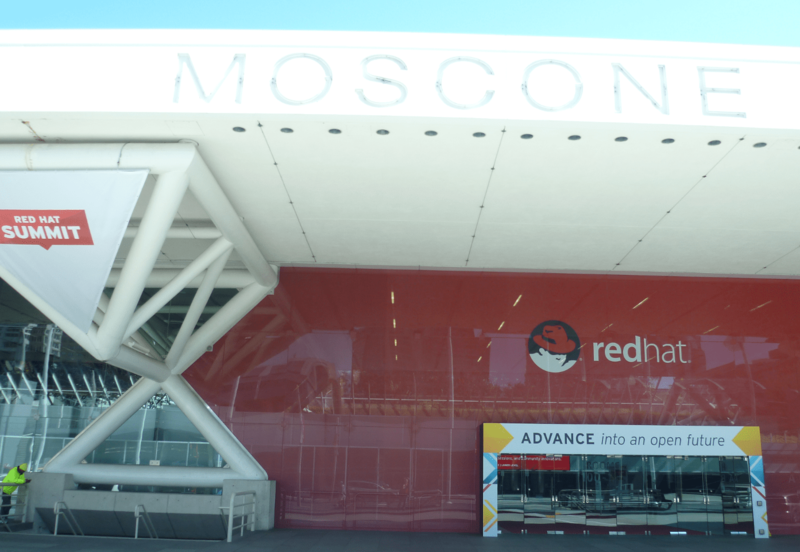 Tags: 2014, Moscone, Red Hat Summit, San Francisco, Summit Radio on April 14, 2014 by dickmorrell.